There are now more than 350,000 quick-service restaurants (QSR) in the United States. With a saturated market and the rise of indirect competition such as online ordering and meal subscriptions—building a loyal customer base is a top priority for QSRs. Our annual Loyalty Index provides the most accurate assessment of customer loyalty, and is proof positive that it’s possible to create a dedicated fan base. 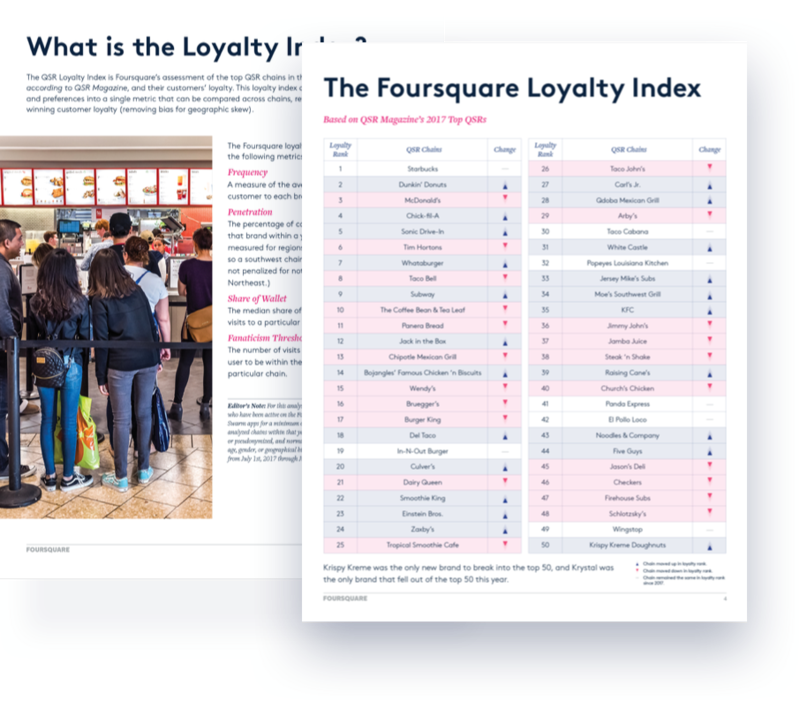 With a deep understanding of how people move around the real world, Foursquare is uniquely able to measure loyalty based on true consumer behavior, rather than perceptions of a brand. This loyalty index distills a complex set of behaviors and preferences into a single metric that can be compared across chains, revealing which QSR chains are winning customer loyalty. Is your brand at the top of the list? Take a look.